This chickpea omelette is the best invention for a vegan breakfast since sliced bread! It’s vegan, gluten free, soy free, and of course egg free, yet tastes surprisingly similar to egg omelettes! If you haven’t cooked with chickpea flour yet, you have to try this recipe! It cooks up like magic! They’re incredibly easy to make and you can add any of your favorite ingredients like mushrooms, peppers, spinach, or onions. 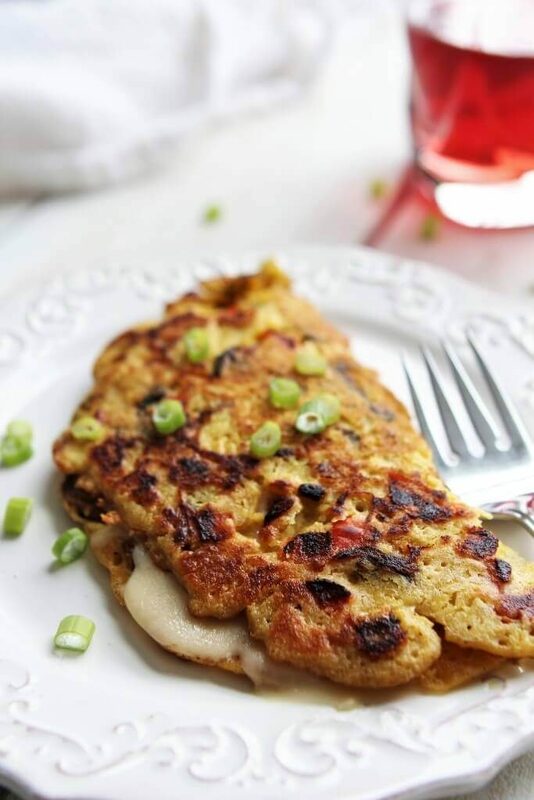 Fold in some vegan cheese and you will have an unbelievable vegan chickpea omelette! They are vegan, gluten free, soy free, and nut free! They’re a delicious high protein breakfast that will keep you full all morning. You can add and veggies that you like to suit your taste! 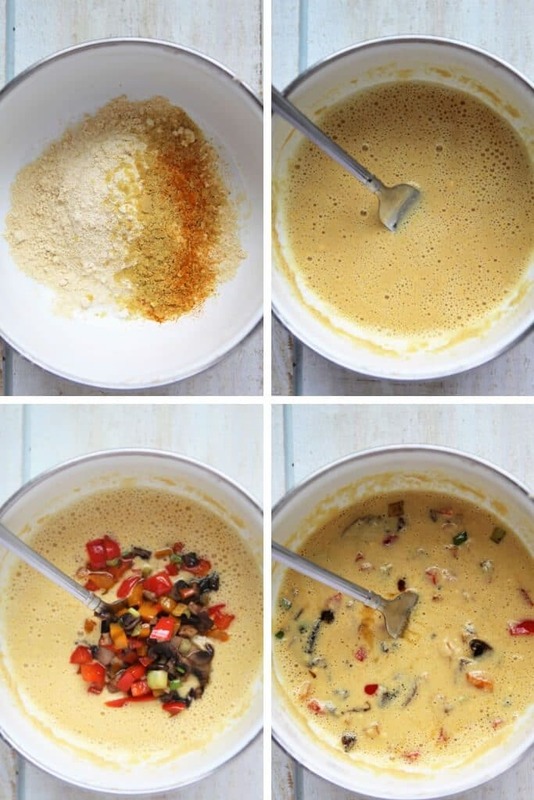 Mix the dry ingredients ahead of time to have easy, ready to make omelettes anytime. They work great for camping and backpacking too! Just bring dry mix along and add water! What are chickpea Omelettes made from? 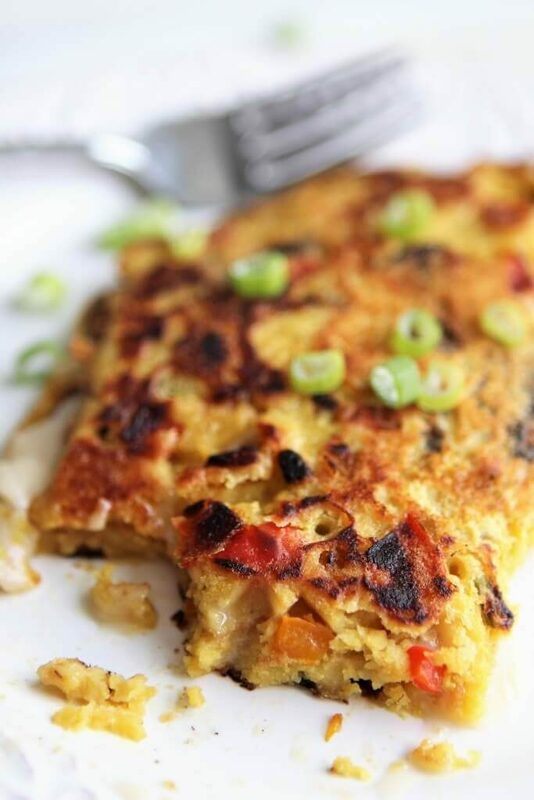 These vegan omelettes are made from chickpea flour aka garbanzo bean flour. If you have never used chickpea flour before, it’s pretty amazing stuff! It is high in protein and fiber and when mixed with water and cooked, has an egg-like flavor and texture. How do I make a chickpea omelette? Mix chickpea flour, nutritional yeast, salt and water in a bowl or jar and stir until there are no lumps. Dice up veggies you want to add to your omelette. (about ¼ cup of veggies per omelette). Add oil to a well-seasoned iron skillet or a non-stick frying pan. Saute the veggies on medium-low for about 3-5 minutes until they become tender. Add the sauteed veggies to the chickpea flour batter. Pour the chickpea flour batter in a hot oiled skillet and cook for about 5 minutes over medium heat until the top of the omelette no longer looks wet. Carefully flip the omelette to the other side and cook for 3-5 more minutes until it is no longer soft in the middle. (Loosen up the bottom with a spatula before flipping so it doesn’t stick and break). Top with cheese and fold over so that the cheese is in the middle. You can make as few or as many as you want. This recipe is enough to make 1 omelette, but adjust to meet your needs. You can also mix the dry ingredients ahead of time and keep in in a sealed container in the pantry, then when you are ready to make omelettes, you just need to add water and veggies. Make sure it is cooked thoroughly! Raw chickpea batter tastes terrible, but it magically turns delicious once it’s cooked. What things can I add to a vegan chickpea omelette? Use a well-seasoned iron skillet or a non-stick frying pan. It will stick to the pan more than an egg. Let the omelette cook over medium heat for about 5 minutes until the top is no longer wet before flipping. Saute the veggies first and then add them to the batter. You can cook them and then pour the batter over the veggies in the pan, but I find it sticks more when I do it this way. Don’t taste the batter!!! Chickpea flour tastes awful before it’s cooked. Once it is cooked through, it will be delicious! What else can I do with chickpea flour? If you like these chickpea omelettes, you will love this chickpea bread. It’s gluten-free, vegan, and yeast free and you can change it up and make any flavor that you want. 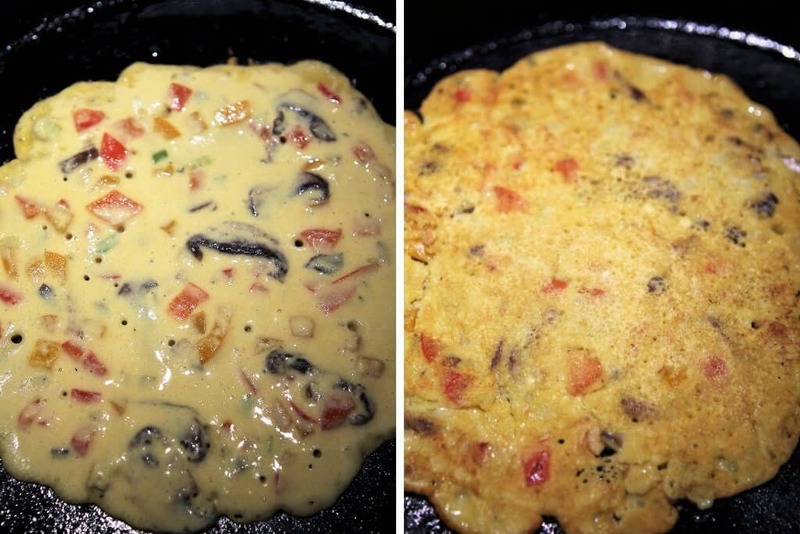 Want to make these vegan omelettes when you are camping? See my vegan boil in a bag omelettes for the best vegan camping food idea ever! 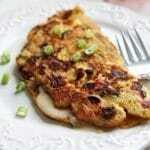 Don’t forget to pin the vegan chickpea omelette recipe for later! 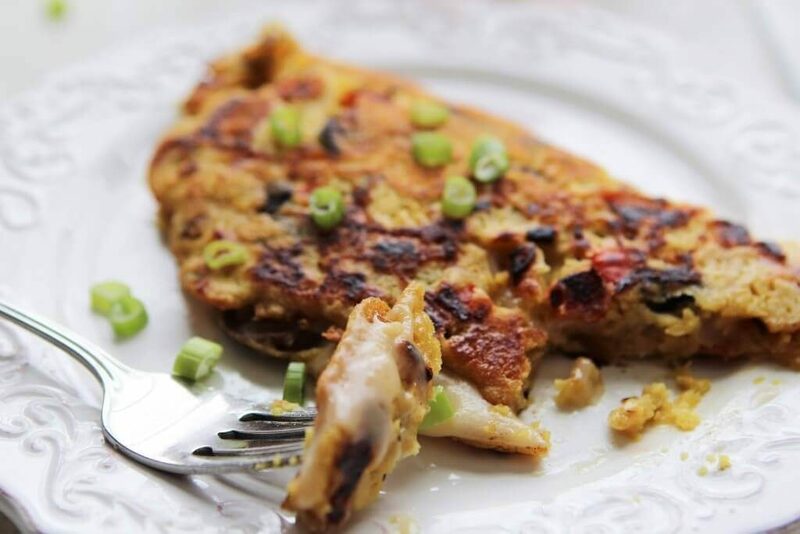 A gluten free, soy free, and vegan omelette using chickpea flour and fried in a skillet. Mix chickpea flour, nutritional yeast, salt and water and stir until there are no lumps. Dice up whatever veggies you want to add to your omelette. (about ¼ cup of veggies per omelette). Add oil to a well-seasoned iron skillet or a non-stick frying pan and saute the veggies on medium-low for about 3-5 minutes until they become tender. Remove the veggies and add them to the batter and give the batter another stir. Turn up the heat to medium and pour the batter in the skillet like you would a large pancake and cook for about 5 minutes until the top of the omelette no longer looks wet. Carefully loosen up the omelette with a spatula and flip the omelette to the other side and cook for 3-5 more minutes until it is no longer soft in the middle. (Make sure there is no wet batter left in the center). This recipe is for 1 omelette, adjust the number of servings to the number of omelettes that you want to make. Make sure to use a well-oiled pan to avoid sticking. Chickpea omelettes tend to stick to the pan, so be sure to use enough oil, allow the omelette to cook until it becomes solid, and loosen it from the bottom of the pan before flipping. Raw chickpea flour tastes terrible! Don't eat it until it's fully cooked! Game changer! This is seriously delicious, easy to make too – THANK YOU. Ooh! I can hardly wait t try this! My breast cancer surgeon said I am not to eat soy products … most vegan omelette recipes use tofu. Also, I really appreciate that you provide the nutritional analysis with your recipe. Have been cancer-free since 2008 .. : ) and started my plant-based eating January 2017 … and so loving all the new foods! My husband is open-minded about it all … but at 72, won’t be easy to get an Irish guy to give up meat. Will comment on any recipe I try .. 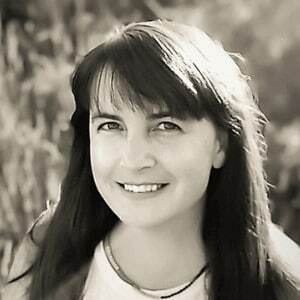 I know how helpful feed back is … for you & for the readers. Have a great day! So happy that you have been cancer free for so long! Thanks for the comments on any recipes. Hope you enjoy them! I love these omelets! I eat them all the time now! It’s nice to have a hot breakfast with lots of protein. It fills me up all morning.